Bundesliga | #BLKickOff - Join in and win on Twitter! #BLKickOff - Join in and win on Twitter! Cologne - The start of the 2015/16 Bundesliga season is upon us, and to get you into the mood for yet another campaign of drama and emotion, we are running a competition on our official Twitter account. 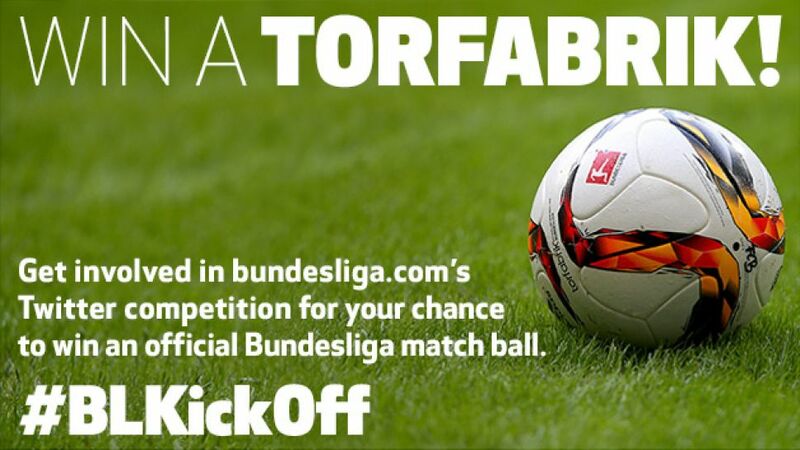 Running up to and including the first weekend of the Bundesliga season, you can win one of three TORFABRIK footballs by responding to us on Twitter. Using the hashtag #BLKickOff, we will be asking one question each day. How can you win? All you have to do is answer, either by retweeting or favouriting our Tweet, and you will automatically go into the draw for one of the three official Bundesliga matchballs on offer each day up to and including Sunday 16 August. Don't forget, you need to be following @Bundesliga_EN on Twitter to have a chance to win. Winners will be contacted via Direct Message. Below are the terms and conditions for participating in competitions run by the DFL Deutsche Fußball Liga GmbH. The DFL Deutsche Fußball Liga GmbH, Guiollettstraße 44-46, 60325 Frankfurt am Main, hereafter referred to as the ‘DFL’, has organised a competition. The following conditions of participation, which are legally binding should the participant agree to them, are applicable to all competition participants. Only people who have declared their willingness to consent to these terms and conditions by participating in the competition are eligible to participate and win prizes. The competition will run from 10 August 10:00 CEST until 16 August 23:59 CEST. Participation is only possible by retweeting or favouriting the tweet from @Bundesliga_EN containing the question. DFL employees, or those of affiliated companies, are not eligible to participate. The competition will be conducted as a draw among the participants who answered the daily question from the @Bundesliga_EN account by retweeting or favouriting the corresponding tweet. There are three adidas TORFABRIK balls to be won each day. Prizes are not transferable. A cash payment in lieu of the prize is not possible. The winners of the competition will be informed via a Direct Message. The prize will then be sent by post. The DFL will save, process and use the participant’s personal details (name, address, telephone number) solely for the purposes of the technical administration of bundesliga.com and the processing of the competition in question. The DFL will not pass on your personal details to any third parties under any circumstances. Only in the event of the user providing their consent – which can be revoked at any time – will the DFL use a users’ personal details to inform them of the provision of services, in addition to the latest news from the Bundesliga and the DFL. The general privacy statement of the DFL still applies: www.bundesliga.com/en/privacy-statement/. The DFL only holds a person or party, for whichever legal reason, subject to liability in relation to the implementation of the competition if damage is caused by a culpable violation of a contractual obligation in a way that jeopardises the fulfilment of the contract or is attributable to malice or gross negligence. Should the DFL hold a person or party liable for the endangerment of a contractual obligation without malice or gross negligence, liability will be levelled upon completion of the contract and limited to the extent to which the DFL was required to account for circumstances known to it at the time. The above limitations or exclusions may not apply in cases for which legal liability is urgently provided, particularly in cases of culpable injury to life, body and health or concerning liability claims under the Project Liability Act. Insofar as the liability of the DFL is barred or limited, this also applies to the personal accountability of the service provider, employees, representatives and various agents which the DFL have commissioned or contracted for the completion of the competition. The decision made is final.